It costs about $300,000 for each new bed at UC Santa Cruz. That figure includes the cost of the dorm or apartment around the bed, not just the mattress and frame. UCSC plans to add anywhere from 600 to 800 new beds in preparation for UC-mandated enrollment growth over the next five years. That’s $180-$240 million — about the same cost as annual in-state tuition and fees for 13,000 to 18,000 UCSC students. The university’s prioritization of enrollment growth instead of providing affordable and accessible education is the root of the problem. The UC’s focus on expansion inhibits individual campuses from maintaining their quality of education and ability to meet students’ expectations for their pricey degree. Adding more beds to address enrollment concerns is premature when advising resources are limited, TAs are overworked and class sizes are in the hundreds. UCSC needs to address current problems facing the student body, like overcrowded buses and facilities, before demand for already-strained resources increases. Next fall, UCSC plans to enroll about 300 more students than in 2014 — the lowest increase out of the nine undergraduate UC campuses — as part of UC President Janet Napolitano’s plan to boost UC-wide enrollment by 10,000 students over the next two years. Part of that is to add 14,000 more beds across UC campuses by 2020. At UCSC, about 53 percent of students — 8,655 undergraduates and 184 graduates — live in campus housing, said Sue Matthews, associate vice chancellor of Colleges, Housing and Educational Services. Students go through a lengthy application process for housing, many with dwindling hope of getting their top choice or even any choice because bed occupancy is at over 97 percent, Matthews said. 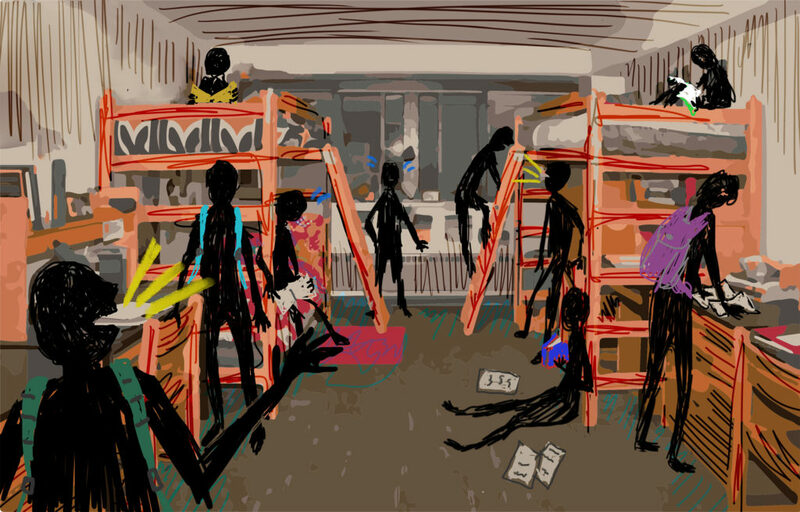 With very little room for more students to live on campus, UCSC has no choice but to build more beds, even though it is a faulty solution. UCSC turned 450 more doubles into triples between 2012-15, totaling a staggering 5,307 triple bed spaces on campus, compared to about 1,300 doubles and 1,900 singles. Since fall 2005, UCSC has added 3,000 students and 2,100 beds across campus. Turning singles into doubles and doubles into triples barely remains an option because many of these conversions have already occurred and resources are running out. UCSC has one of the highest housing rates in the system, and to charge students upward of $1,400 per month for a small triple with a full meal plan is hardly considered accessible for the majority of students. Moreover, multi-million dollar developments should not be made into solutions that compromise the integrity of UCSC’s unique landscape. Expansion slated for Porter meadow or plans to rebuild Kresge into dorms instead of apartments are disappointing examples of how this plan will change the campus’ distinguishing features. Applications for fall 2016 rose 8.8 percent to nearly 60,000 students, over 10,000 more than two years ago. Systemwide, over 200,000 students applied to at least one UC campus. Demand for the “high quality” UC education continues to increase, but so do class sizes and lines outside of advising offices. Proposals for classes that start at 7:15 a.m. or end at 10:25 p.m. to address enrollment concerns use the same flawed logic as the idea of building more beds. Sacrificing students’ quality of life through extreme class times or cramped living spaces doesn’t match the quality of education the UC boasts. For an administrator to suggest that couches in libraries is anywhere near appropriate compensation for a lack of housing shows an ignorance to a problem greatly affecting students. She said UCSC is “literally looking at all possibilities” to solve the housing crisis, but isn’t one of those “possibilities” pushing against enrolling less students? When tuition hikes were passed last November, Janet Napolitano and Gov. Jerry Brown were at odds. Napolitano said the state wasn’t adequately funding the UC, and Brown said the UC needed to better allocate its funding. They came to a compromise to avoid the immediate strain on students’ wallets, but Brown agreed to increased funding contingent on enrolling more in-state students. This enrollment issue goes beyond Napolitano and Brown and into the continual deprioritization of public education in this state and beyond. It’s painful to look back to the original California Master Plan of Education and fawn over the concept of free education because the plan is so far off track now. UCSC will reach its $250 million debt cap to renovate Family Student Housing and Kresge, and fund the Porter meadow expansion. It’s more money than UCSC collects annually from the entire student body’s tuition and fees. Loaning more money than any single source of income is an irresponsible investment, especially when it’s detrimental to its only client — its students.